Please refer to our stock # 3438 when inquiring. This rare Japanese bronze incense burner is a mid or late Meiji period product. It depicts a crane resting on an upside down lotus leaf. A small snail is sitting on the leaf as well. The hollow body of the crane is used as burner; the wings can be removed to put incense inside. The open beak and small holes under the feathers will let the smoke out. 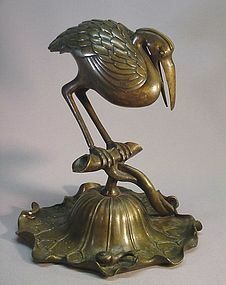 There is a polished bronze inlay crest on the crane’s head and small bronze points on the feathers. It is 8 ¾” high and 7” wide at the base of the lotus leaf. It is in excellent condition.